Is there anything more relaxing than the sound of rain? When you wake up in bed, super cozy and sleepy, and you can hear raindrops falling on the roof? There’s one other thing I can think of that is even more relaxing: staying in your pajamas and watching a rainy day movie! Here are a few of my favorite picks that I hope you’ll love! Need something for the kids to watch? 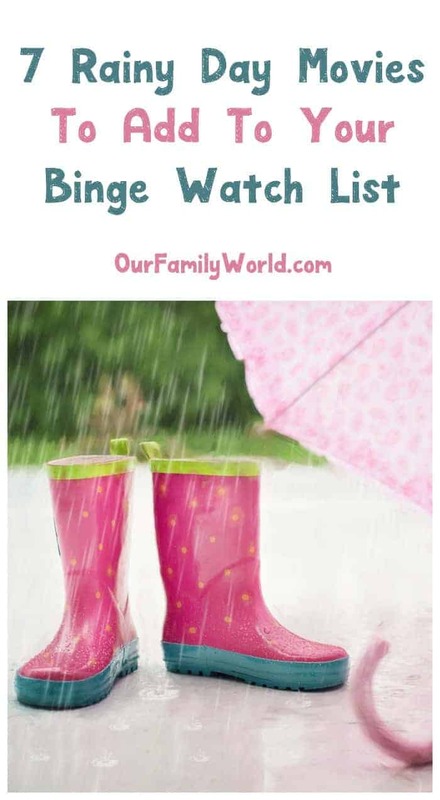 Check out our favorite family-friendly movies to watch on a rainy day! Adapted from a Stephen King short story, this film is seriously riveting from start to finish. Follow the story of Andy Dufresne who is in Shawshank prison for a crime he did not commit, as he forms an unlikely alliance with Ellis Boyd. There are few movies that I enjoy watching more than once, and this is one of them. If you’re looking for a fabulously gripping rainy day movie, this one has got you covered. GET IT ON HERE. When I was in high school, my friends and I were all absolutely obsessed with this movie! Telling the story of rich high school student Cher and her band of clichéd friends, this movie is a loose adaptation of Jane Austen’s “Emma”. Cheesy, chintzy, and laugh out loud funny, this great movie will fit the bill on any rainy day. BUY THE MOVIE HERE. A fabulous movie, which tells the tale of young Billy who loves ballet but lives in an area of northern England where boys Do Not Do Ballet. A fantastic movie about family dynamics, following your dreams and acceptance, you are almost definitely going to need to a box of tissues beside you while you watch it! RENT THE MOVIE HERE. Yes, it’s technically a kid’s movie. And yes, it is hilarious and a movie that the entire family can watch together and actually enjoy! Follow the tale of Judy Hopps, a bunny who becomes a police officer in the metropolis of Zootopia. Along the way, she faces discrimination and stereotypes, which don’t stop Judy from making her dreams come true. A great Disney movie for young and old alike! No movie is complete without snacks, so check out our Zootopia cupcakes! Whether you’re a mom like me or not, Bad Moms is sure to have you snorting with laughter all the way through. A tale of three moms who are overworked and feel underappreciated, whose friendship guides them towards a sense of freedom and happiness. A comedic hit, best watched with your closest girl friends! GET THE MOVIE HERE. A fascinating critically acclaimed movie, which tells the true story of a fur trader in the 1820s who is violently attacked by a bear, and subsequently being left in the wilderness by members of his own hunting team. A fascinating tale of revenge as well as the power of the human spirit, The Revenant is must-see film viewing at its best! I hope you enjoyed reading my list of perfect rainy day movies. What are some of your favorites? Such a great list! I am definitely a fan of a few of these and still looking forward to seeing Bad Moms soon. Such a great list! I am definitely a fan of a few of these and am still looking forward to seeing Bad Moms soon.